On the agenda for this round are issues of governance -- a political transition, the constitution and elections, as well as counter-terrorism at the request of Damascus. GENEVA: Syrian rivals were to resume UN-brokered peace talks in Geneva on Thursday, with escalating violence and deadlock on key issues dimming hopes of a breakthrough. UN envoy Staffan de Mistura tried to strike an optimistic note when the previous round ended last month. He insisted government and rebel negotiators had agreed on a "clear agenda" and that "everything is ready" for the talks to move forward. But an already-fragile ceasefire has deteriorated further in recent days after rebels and allied jihadists launched two surprise offensives on government positions in Damascus and central Hama province. Syrian President Bashar al-Assad's air force has responded with raids on rebel targets, further threatening negotiations which have yielded little in four previous rounds. The UN talks aim to find a solution to end a six-year conflict that has killed more than 320,000 people and displaced millions since it started in 2011 with protests against Assad's regime. A stalemate persists over most of the toughest issues, notably Assad's fate, with the opposition insisting he quit power and the government declaring the president's future off limits for discussion. And analysts say the chances of compromise may be at their lowest point ever, following the regime's military victories. "There's no hope in my view," Syria specialist Thomas Pierret said. "The regime continues to gain ground... There's no reason for it to make the slightest concession." 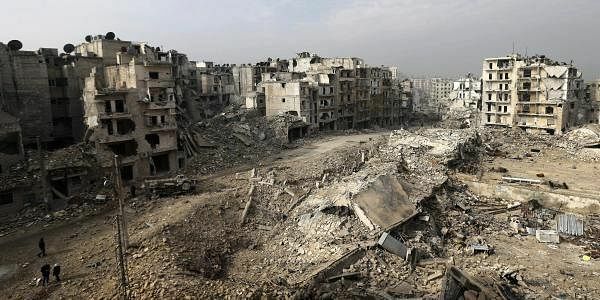 Since Russia's military intervention in support of Assad in 2015, the regime has gained the upper hand, retaking the former rebel bastion of Aleppo late last year. The main opposition High Negotiations Committee (HNC) arrived in Geneva on Wednesday. The government delegation led by Syria's UN envoy Bashar al-Jaafari was also due to land in the Swiss city. De Mistura is scheduled to be in Ankara on Thursday as part of a pre-talks diplomatic tour of the key powers shaping the conflict, which has also included trips to Moscow and Riyadh. The UN's deputy Syria envoy, Ramzy Ezzeldin Ramzy will meet the rival camps in Geneva "to prepare the round ahead", the UN said. So far, there is no plan for the government and rebels to meet face-to-face. De Mistura has said he wants to unify the HNC with two smaller opposition camps -- known as the Moscow and Cairo platforms -- before presenting the government with a single rebel delegation. But unity among the opposition has remained elusive due to disagreements over core issues like Assad's future.